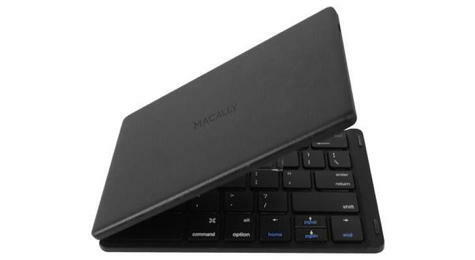 I’ve never considered folding keyboards cool, but Macally’s PMOBILEKEY changed my mind. It’s portable, beautifully made, and it’s loaded with features. If you often, or even occasionally, type on-the-go, this little gem will fill your needs. With the press of a key, it will pair with iPhone, iPad, macOS, Android, Windows, Smart TVs, and streaming devices with a Bluetooth host. When folded, it’s a nearly pocketable 5-1/2” x 4” x 1/2” (14 x 11 x 1.3CM). When open, it’s the width of a standard laptop keyboard. The scissor-key switches are accurate and have a good, comfortable feel. The hinge makes the center keys a bit farther apart horizontally and the spacebar is split, but in my case, neither interferes with typing. There is no on/off switch necessary as the keyboard is only on when it’s open. To conserve power, it also sleeps when it is not in use. A rechargeable battery supplies power for up to 40 hours and a small low-battery LED will warn you if necessary. A micro USB charging port is located on the left edge. 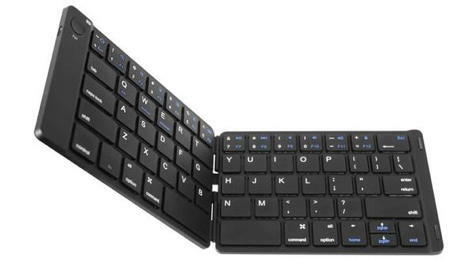 Any standard charger or computer USB port will charge the keyboard fully in two hours using the included cable. For portable devices I generally prefer ones using AA/AAA batteries because stopping to recharge in the midst of work is a pain. However, since this keyboard will run up to 40 hours on a charge, this is less concerning. The top row of keys serves multiple purposes: numbers and special characters are typed as expected and a variety of shortcuts can be invoked while the FN key is pressed to return to the Home page, control audio settings, etc. These shortcuts support macOS, iOS, Windows, and Android platforms. 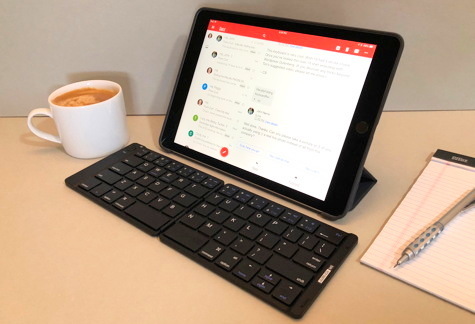 I seldom travel with anything but my iPad Pro and iPhone and as a result I always carry either a separate Bluetooth keyboard or a bulkier iPad case with a built-in keyboard. With the Macally PMOBILEKEY, I have cut down both the weight and the bulk of what I must pack while gaining convenience and portability. MyMac Reviews rating is 9 out of 10. Nicely done, Macally.